David Trafford and Peter Boggis argue that organisational capabilities have an important role to play when developing strategy or implementing change. They discuss how existing organisational capabilities can inhibit change by anchoring an organisation to its current trajectory – thereby taking it to its default future – and that new organisational capabilities are needed if an organisation is to have any success in pulling itself to its target improved future. In previous articles we have argued that all organisations have a ‘default’ future and that it is the responsibility of leaders to confront this future. If they consider it unacceptable then they are accountable for defining a future that is not only better but achievable. We have also argued that the main reason the majority of strategies and major change initiatives fail is because the forces driving the organisation to its default future are ignored or their influence underestimated. Only by understanding these forces and putting in place the necessary conditions for change success will leaders be able to alter the trajectory of their organisation away from its default future to an improved future. One of the most powerful of these driving forces is the organisation’s existing organisational capabilities – the very capabilities that have contributed to past and current success. But are these capabilities the ones needed for future success? If the target improved future is different to the default future, then it’s highly likely that different organisational capabilities will be needed. It is not to say that all existing capabilities will need to change, only those preventing the organisation altering its trajectory away from its default future. The aim is to have the organisational capabilities in place that will ‘pull’ the organisation to its targeted improved future. 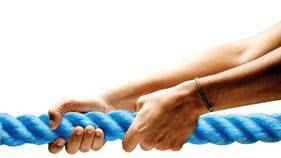 The ‘pull’ approach is contrary to how most change initiatives are undertaken. In most cases change is ‘pushed’, either implicitly or explicitly. The push approach is predicated on the assumption that successful change is achieved through the execution of a series of steps, essentially implementation of a pre-defined plan; where the completion of each step takes the organisation closer to its target state. The weakness of this approach is that it assumes that organisations are deterministic and ‘programmable’. The reality is that changing an organisation is not like changing the engine of a car or building a bridge. Organisations are not static or predictable under change; they are dynamic systems that respond – often in unforeseen ways – when attempts are made to change them. As a consequence a change plan is always out of date. Furthermore, having a change plan can lead people to believe it is someone else’s responsibility to implement the change, namely the people implementing the plan. The push approach therefore has a number of limitations, the most significant being that it doesn’t create a context where people can exercise their judgement, apply their experience and use their expertise to pull the organisation to its target improved future. Plans are of course necessary, but in themselves they are not sufficient. But the ‘pull’ approach requires more than having a vision. While a vision aims to describe a motivating target future, it will be no more than a dream if the organisation does not have the capabilities needed to pull itself to its target future. Having these capabilities in place enables people to change their organisation’s trajectory through the thousands of decisions and actions that are taken daily. A vision is a necessary component of the ‘pull’ approach, but not sufficient. What do we mean by organisational capabilities? Firstly it’s important to make a distinction between organisational capabilities and individual competencies. Where competencies are held by individuals, capabilities are held within organisations. Obviously it’s not possible for an organisation to have capabilities without having competent people. But these people don’t need to be super-smart or highly intelligent because organisational capabilities are developed through application and practice. Like muscles, they get stronger the more they are used. Also, the more embedded they become the greater their influence on organisational culture. They can also become organisational habits, where people collectively do things in a particular way without consciously knowing how or why. As we will explore later in this article, their impact can be profound when it comes to developing strategy or implementing change, as existing organisational capabilities can make it difficult to alter an organisation’s trajectory away from its default future. Organisational capabilities are based upon shared mental models, frameworks, language, skills, mindset, beliefs, conventions and experiences that collectively drive organisational behaviour. Significantly, they are not lost when individuals leave. Examples of organisational capabilities are given below. Innovation: the ability to continually come up with new products and services and successfully bring them to market. Customer experience: the ability to continually give customers experiences that have a positive impact on the impression they have of your company. Cost control: the ability to manage all aspects of cost throughout the value chain. Acquisition integration: the ability to identify and integrate acquisitions quickly and effectively in ways that preserve and nurture what has been acquired. Organisational agility: the ability to sense and respond rapidly to changing customer and market conditions. Horizontal integration: the ability to drive a common and shared approach to running the enterprise across multiple divisions and countries, supported by a common business technology platform. Vendor relationship management: the ability to create value from externally provided services. Health and safety management: the ability to prevent accidents in the workplace. 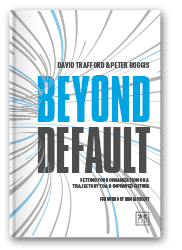 While researching our book Moving Beyond Default, we identified several organisations who were using organisational capabilities to pull themselves into their target improved. Three examples are given below. In our first example a very successful builders merchant and DIY chain recognised they lacked a compelling online presence. The more they thought about it the more they realised it wasn’t just a case of updating their website, but fundamentally rethinking their multi-channel approach to customers. After initially asking their IT organisation to take the lead it soon became apparent that they didn’t have the capability to deliver a successful outcome. The more the CEO and his executive team understood what they wanted to achieve, the more they realised they simply didn’t have the capabilities needed, and that developing them in-house would take too long. The decision was therefore taken to acquire a company that had strong multi-channel capability. It was only after the acquisition that they fully understood and appreciated the capability they had acquired. It wasn’t so much the multi-channel business model, but the way people thought, acted and behaved. The challenge now for the CEO and his executive team is to spread these capabilities across other companies in the group without diluting or destroying what they have acquired. In our second example the CEO of a successful home and motor insurance company wanted to give his customers ‘cool things’ digitally. He wanted to take his company to the ‘next level of digitisation’, where customers would have an easy to use, compelling and differentiated online (including mobile) experience, and where the cost of back-office processing would be significantly reduced through greater automation. The company already had a website that was no worse or better that the rest of the industry; what was lacking was the capability to realise his vision. While the IT organisation was perfectly capable of updating the website and managing their legacy systems, it lacked a fundamental understanding of what the ‘next-generation’ digital experience would look and feel like for customers and colleagues. What’s more, the CEO felt that the major consultancies and system integrators had little to offer in this respect. In the end he turned to other industries that did have the people with the competencies he was looking for, including online gaming and social media companies. In our final example, the newly appointed CIO of an energy utility needed to transform the technology base of the company whose legacy systems were increasingly difficult and expensive to maintain. Rather than starting with a traditional migration plan, he began by identifying the organisational capabilities needed to successfully operate in the target future. He then acquired these capabilities through in-house development, recruitment and partnerships. As the capabilities were put in place, the transformation plans were developed and executed. The beauty and power of this approach is that the people with the new capabilities were collectively able to stand in the future, and by looking back “manage the present as a past condition of the future”. When asked why he’d taken this approach, his response was that he had tried ‘push’ approaches in the past and the ‘pull’ approach was much faster and more effective! It’s interesting to note that in all three examples information technology (IT) plays an important part. While it’s well accepted that IT plays a critical role in the operation of most organisations, it’s less apparent that the IT installed base – and organisational capabilities that reside within the IT organisation – act as a powerful force taking an organisation to its default future. And as a consequence, this makes changing an organisation’s trajectory to a different – and hopefully improved – future more difficult. Existing organisational capabilities can become organisational habits: they are the source of what organisations instinctively do. As they have been the source of success in the past, it’s assumed they will be the source of success in the future. It’s a natural reaction when things get tough to rely on what we know and what you can do. It’s the same with organisations. When things get difficult, they make their existing organisational capabilities work harder. As these organisational capabilities are embedded and omnipresent, it’s difficult for an organisation to appreciate that they exist and, as a result, they are blind to the need for new ones. A good example of this trap is what’s currently happening on high streets across the UK. While online sales continue to grow year-on-year, traditional ‘bricks and mortar’ retailers are finding it increasingly difficult to compete. As a result several established brands, including HMV, Comet and Jessops have recently gone into receivership. Industry commentators are quick to point out that they failed because they didn’t recognise the threat from online competitors and were too slow in changing their business model. Easy to say, but the organisational capabilities of these companies were those needed for high street retailing. It’s therefore not surprising that they failed to recognise and acquire the capabilities needed for e-tailing. In today’s world where information is readily available it’s all too easy to believe you understand something, when actually you don’t. Equally, when you visit a company and observe interesting ways of doing things you may think that you understand the underlying processes and supporting technology, when actually you don’t. It’s the same with organisational capabilities. You may be able to name or even describe them, but true understanding only comes from experiencing them. In one of the examples above it was only when the IT organisation tried to implement the multi-channel strategy that it realised it – and the business – didn’t have sufficient understanding of what was really needed. The risk is that strategies and change programmes are formulated on a shallow understanding of the organisational capabilities needed to successfully operate in the target future. In 2010 David Cameron, the Prime Minister of the UK, announced the most radical transformation of the National Health Service since its formation in 1948. The essence of this change was separating demand from supply. In the new model General Practitioner consortia would be created and commission treatments from service providers, principally the hospitals. The aim was to increase competition between service providers, improve the patient experience and drive greater efficiencies. To make this happen, new organisational capabilities would be required. After these transformational changes were announced we had the opportunity to run a number of workshops with junior doctors, consultants and hospital staff. It was apparent to everyone that the capabilities needed to operate the new model simply did not exist and would take considerable time and effort to develop. Over time, business functions like IT, HR and Finance learn what is expected of them and develop capabilities to meet these expectations. For example, most IT organisations have developed the capabilities needed to keep the systems running, fix problems when they occur and manage the risks that come with a complex legacy installed base. They do everything to avoid their CIO getting a call from their CEO asking when the systems – and the business – will be up and running again. But if the context changes – for example, the organisation decides to re-platform their core IT systems – the existing capabilities within the IT organisation may no longer be sufficient, particularly if the decision is taken to use an offshore provider to configure and maintain the new platform. In this situation, it’s highly likely that the current organisational capabilities – that have been valued in the past – create an anchor to the present way of doing things and puts the transformation at risk. If we accept that organisational capabilities are based upon shared mental models, frameworks, language, skills, mindset, beliefs, conventions and experiences, it’s reasonable to assume that they are a major influence in determining how things get done – thereby shaping the organisation’s operating model. Or to put it another way, an organisation’s operating model is a manifestation of the organisational capabilities. It’s interesting to note that in most transformation programmes one of the first questions consultants ask is “what’s the target operating model”? If the people defining the target operating model are the same people that operate and manage the current model, then the best one can expect is improvements to the current model. If true transformation is to be achieved then the new operating model needs to be defined and built by people who collectively possess the organisational capabilities needed for the target future. If we accept the argument that existing organisational capabilities determine how an organisation operates, it could also be argued that an enterprise consists of a portfolio of organisational capabilities. And like any portfolio, it needs to be managed. Not all organisational capabilities will be of equal importance and their contribution will change and shift over time. Tension is also likely between those people who value the ‘old’ capabilities and those who see the need for new ones. As one CEO put it: “We know cost control is our strongest organisational capability, and it’s also the one that stops us innovating and thinking long term”. If this argument is accepted then the role of leaders is to identify and acquire new organisational capabilities, nurture the ones that are most needed today and ‘retire’ those whose contribution prevents the organisation changing its trajectory to its targeted improved future. We believe organisational capabilities can be assessed in terms of their importance and maturity, and that they can be acquired in a number of different ways. Both these aspects will be covered in future articles. Which organisational capabilities are defining your current trajectory and taking the organisation to its default future? What new organisational capabilities are needed to change the trajectory and pull the organisation to its targeted improved future? How these new organisational capabilities will be acquired?